Nearly everyone has a celebrity doppelgänger, but for a select group of regular people, the resemblance between them and their famous lookalikes is so uncanny that they have even signed autographs and posed for photos as their star counterparts. Click through and check out 18 regular people who could easily pass for being a certain celebrity's twin. Both Miley Cyrus and her lookalike Jessica Vill enjoy posting selfies to Instagram. The only thing better than being one of Hollywood's most beautiful women is looking just like her! Morgan Jensen looks so much like the pop star that even Taylor Swift was tricked into thinking a photo of Morgan was a pic of herself. Her name may not start with a "K," but Alanis Stormy certainly looks like she could be a part of the Kardashian-Jenner family. Doppelgänger Francesca Brown doesn't just look like Katy Perry. She's also dressed up in similar costumes and performed Katy's songs. J. Lo who? From the hair and makeup to the look in her eyes, Jessica Burciaga is nearly identical to Jennifer Lopez. With her full lips and sassy camera poses, Boston-based Andele Lara has been mobbed by fans who mistake her for Rihanna. She says she could easily give up her part-time job and studies to be a professional Rihanna lookalike. British teen Tyler Mitchell could easily pass for fellow Brit and The Imitation Game star Benedict Cumberbatch's younger brother. Reddit user kiimberlyff said that's she often mistaken for Kristen Stewart. 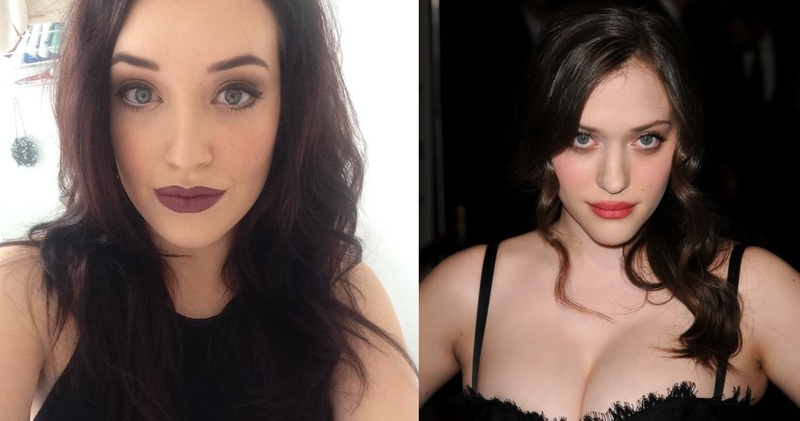 We found 2 Broke Girls star Kat Dennings's Internet twin. Hanadi Kawas has received a lot of attention on social media for looking like Selena Gomez's twin. Reddit user Proxysetting says he has been mistaken for the Steve Jobs actor on several occasions. Whoa! We can barely tell which one of these photos is Emma Watson and which is her lookalike María Maresclop. Is that you, Queen B? Alyxx Dione is a Beyoncé lookalike and an aspiring singer. If SNL ever needs another actor to play President Obama, Chinese actor Xiao Jiguo would make a great addition to the cast. Model and Paper Towns star Cara Delevingne might have to compete for future roles with her teenage doppelgänger Olivia Herdt. Reddit user John Suros says random people always think he's their "friend" Matthew Perry. If our favorite character actor Steve Buscemi ever decides to retire, this Reddit user could easily take his place.